Corn dogs have always been a favorite of mine, I can remember the Corn Dog On a Stick restaurant in the late 70s growing up, and as an adult I have enjoyed a variety of corn dogs as well. These mini corn dogs taste just like a regular one without the stick. So they are easy to dunk into your favorite dipping sauce. As a child, I can remember going to the mall and getting a freshly made corn dog. The Hot Dog On a Stick was one of my favorite places to go. I loved both the corn dog and then the cheese on a stick. When I got older and moved to Texas, we lived out in the country. About once a week we would go into town, and we would go to Wal-Mart. Outside of our Wal-Marts were you guessed it, freshly made corn dogs. We would go get items that we needed and stopped by for a corn dog on our way out. As an adult, I can get those dreadful ones that are frozen. Honestly, I don’t like those; they are pale in comparison in flavor to the ones I got when I was much younger. If you aren’t going to make corn dogs for the whole team, you are left with making a large set up to enjoy your treat. These mini corn dogs require no sticks, and you can cook these in much less oil than you can the whole hot dogs. This batter is sweet and becomes very crispy. So now I can finally enjoy freshly made corn dogs again. I hope you enjoy these as well. Mini corn dogs are so easy to make and make great appetizers. t hot dogs into thirds. Blot hot dogs with paper towels until they are dry. Dip hot dogs into cornmeal mixture. 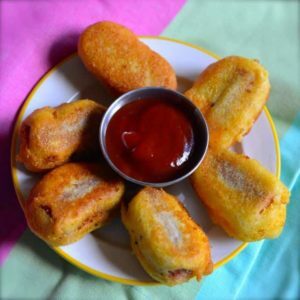 Coat corn dogs with batter, shake to remove excess batter. Drop dipped hot dogs into hot oil. Cook for 2 to 3 minutes or until golden brown. Serve with your favorite condiments. Yummy, love me some corn dogs!